The opponens and adductor pollicis are the main troubleshooters in thumb pain. You can relieve these muscles as well as your pain with a simple, yet effective self massage. Attachment points: Where in your body are those muscles located? Functions: What movements do they do? Pain zones: Where can they send pain to? Overload: What creates problems in these muscles? Impaired movements: Which movements are impaired or painful after overload? Locate The Muscle: Feel it. Massage The Muscle: Goes without saying, doesn’t it? 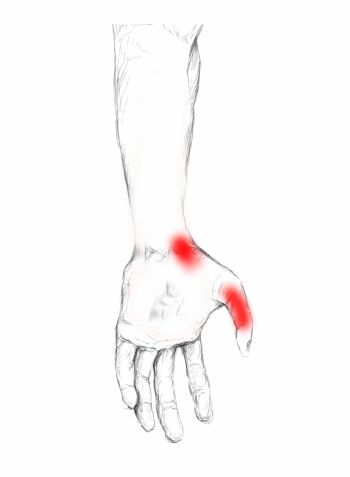 If the adductor and/or opponens pollicis are too tight or contain trigger points, you are very likely to experience pain in the region of your thumb and wrist, as you can see in the pictures below. 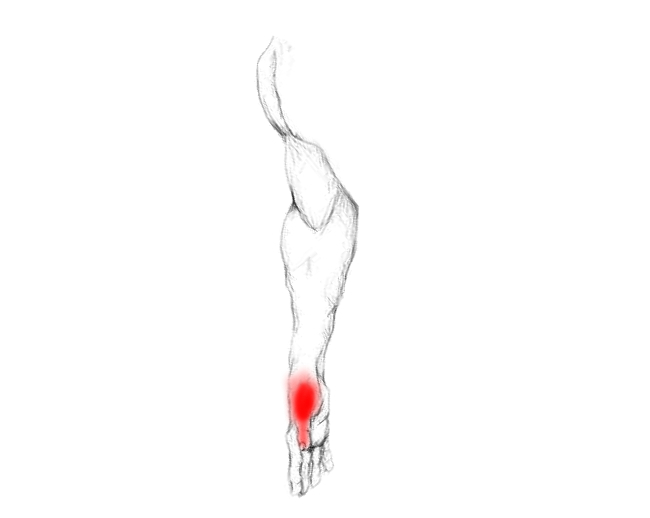 The deeper the red, the more common it is to feel pain in the respective area if the corresponding muscle is too tight or contains trigger points. With too much tension or trigger points in the pollicis muscles, you are prone to feel pain when using your thumb, or even at rest if the muscles are affected severely. Generally spoken, these two muscles run from your wrist bones and your index finger to your thumb. More specifically: The adductor pollicis fastens medially at your 3rd metacarpal bone and laterally at the proximal phalanx of your thumb. The opponens pollicis runs from the flexor retinaculum and the trapezium bone to the metacarpal bone of the thumb. The Xs in the picture display common areas where trigger points often get activated. These are the areas you should check very good when feeling and massaging the muscle in order to relieve your pain. The functions of these two little muscles is to move your thumb towards your index finger – adductor pollicis – and towards your pinky – opponens pollicis –. This way you are able to grab, pinch, compress and squeeze things, no matter if hard or soft. Without them you wouldn’t be able to write, sew or open jar tops. In short, you wouldn’t and couldn’t use your hands the way you are used to. If you read already about the pollicis muscles’ functions, you will realize that you use them all day long. Just think of any hand movement where you do not use your thumb…right, almost not existent. The permanent use of your hands can become too much for the opponens and adductor pollicis. This is especially true if you use them hours long in a repetitive manner – e.g. computer work – or very hard – e.g. hard manual labor like plumbing –. 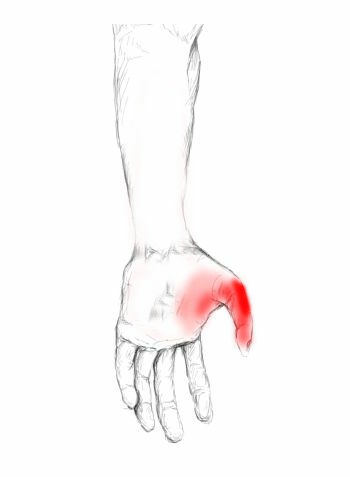 To put it in a nutshell: Every activity that requires long, repetitive or forceful pincer/pinching motions is prone to tighten up the pollicis muscles and thus creating pain, especially in your wrist and thumb. To prevent this from occurring, just massage the muscles after using them very hard or long, and you are likely to be fine. One last note: Fractures of the wrist often cause displacement of its bones and thus influence the surrounding muscles, resulting in increased muscle tension and trigger point development. Sometimes the pain persists after the bones have healed already. In this case, you should definitely check the opponens and adductor pollicis for tender and painful spots. I recommend that you locate and feel the pollicis muscles during contraction. That means, you will perform the muscles’ function and feel where on your hand they are bulking up. Let’s begin with palpating the adductor pollicis. As you might know by now, it moves your thumb towards your index finger. So, place your index finger on your opposite hand in the space between its thumb and index finger. Then put your palpating thumb on the back of the hand and pinch it. Now press the thumb of your painful hand a couple of times against its corresponding index finger. With that movement you should be able to feel the muscle contracting. In order to feel the opponens pollicis, place your index finger on your opposite hand a couple of centimeters below your thumb, close to your wrist. Then press your thumb a few times against your pinkie and feel how the muscle is working. For massage you will try to identify a tender spot in the corresponding muscle, then exclusively concentrate on that area and massage it with 10 – 15 slow and precise strokes. 10 – 15 strokes are enough for one tender spot. When you are done, move on to the next tender area or repeat the massage a couple of hours later. For the massage itself, you either roll the muscle between your thumb and index finger or you massage it with your index finger only. Pay attention not to overdo it here. Otherwise you might end up with strained muscles in your massaging hand. The best is, to keep the massage sessions really short, or to use your index finger only. Bend your index finger and place its “middle” joint on the opponens or adductor pollicis muscle. Then slightly press both hands together and roll with your painful hand over the tender areas.